Happy Spring, everyone! Or for our colleagues in the southern hemisphere, happy Autumn! We thought we'd celebrate the changing seasons by having a look at where people are travelling to at this time of the year. Using our Travel Insight tool, we've pulled the data for journeys happening this season, between March 1st and May 31st, to find out which cities across the world will be receiving the most visitors. Check out the graphs below to find out the most popular destination cities across AMER, EMEA and APAC this Spring. Looking first at AMER, we can see that New York City is way ahead of other major American cities in terms of visitor numbers, with just under 1.25 million people expected to travel to the Big Apple this season. 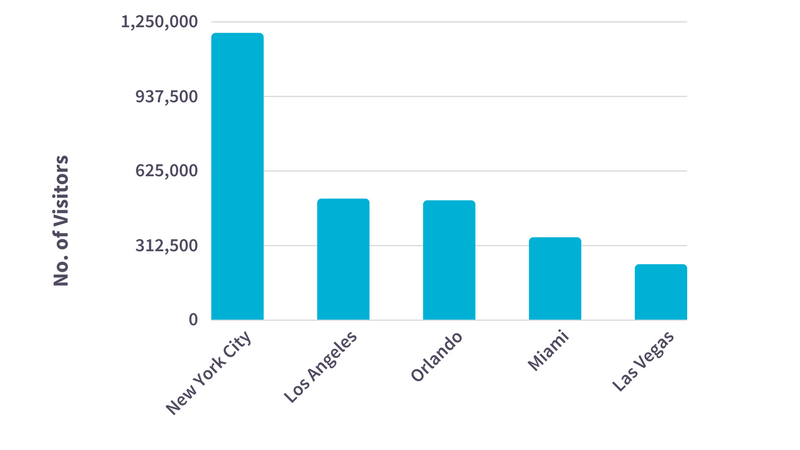 Next most popular are L.A. and Orlando, both hovering around the 500,000 mark, followed by Miami, and then Las Vegas coming in fifth, and expecting to see around 230,000 visitors. Next we head over to APAC, where it looks like Bangkok will be receiving the most visitors this Spring, with almost 1.9 million travellers descending on the city over the three months. Tokyo can expect around 1.5 million visitors, with numbers for Seoul and Tokyo descending until we reach the fifth most popular destination in APAC; Hong Kong is set to host just over 720,000 travellers this Spring. Finally we pulled EMEA data, and found that London is the most popular destination this Spring, with nearly 2.4 million travellers set to arrive in the city. That's roughly double the number of people that are visiting our next two most popular cities; Barcelona and Paris. Finally we have Amsterdam, and then Rome, with roughly 1.1 million and 970,000 travellers heading their way, respectively. If you'd like to know more about our Travel Insight tool, and how it could work for you, please get in touch using the link below!